I dare to imagine a perfect world. I dare to dream that the woman writing my story on these many pages will stop and remember that a boy by the name of Saleem Waziri is here and in search of his family. I dream that I will tell him his brother is well. I dream that we receive a letter declaring that we will not be sent away and that we will be allowed to work and go to school and stay in this country where the air is clear and life is more like metal than dust. Saleem lived in those voids. He lived in the uninhabited spaces of night, the places where bright, cheerful faces would not be. He lived in the corners that went unnoticed, among the things people swept out the back door. Fereiba and her family survived the Soviet occupation of Afghanistan, only to suffer more under the Taliban regime. Unable to provide for her three children, since the oppressive regime prohibits her from working as a schoolteacher, Fereiba packs up her children — including a sickly infant — and embarks on a dangerous and illegal journey to join her sister’s family in London. Along the way, Saleem becomes separated from his mother and siblings and tries to find his way to freedom. Nadia Hashimi tells the Waziri family’s story from the alternating perspectives of both Fereiba and Saleem. Fereiba’s chapters, told in the first person, lend emotional intimacy to the sweeping narrative. 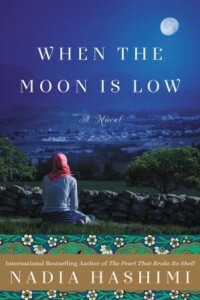 Fereiba’s distinctive voice allows the reader to connect and empathize with her. Saleem’s chapters, written in the third person, include not only his point of view but occasionally the points of view of various other characters. The effect of these additional perspectives is to distance the reader from Saleem. The sections of the book focused on Saleem’s experiences attempt to cover too much territory, and I found myself anxious to return to the chapters narrated by Fereiba. Without giving away important plot points, it’s difficult to reveal much about the family’s odyssey through the Middle East and Europe. Hashimi creates sympathy for her characters along with tension that will keep readers turning the pages. Americans read frequently about the plight of illegal immigrants in the United States, but not as often about the hardships faced by refugees and immigrants in European countries. When the Moon is Low brought to mind Chris Cleave’s Little Bee, another heartbreaking story about the human cost of repressive political regimes. Of course, the best known novels about modern-day Afghanistan are Khaled Hosseini’s — especially his debut, The Kite Runner. The Kite Runner is often credited with introducing Afghan culture to Americans; in an interview with the Atlantic, Hosseini says: “Most readers have come away with a sense of empathy for Afghanistan and its people; there’s been awareness of the richness of its culture, its heritage and its history.” Hosseini — like the fictional Saleem in When the Moon is Low — was forced to flee Afghanistan as a teenager. I think my strength is in telling a story. That’s my strength. I can keep a reader’s interest. I can bring a sense of anxiety to every page; bring a sense that something’s at stake in every page . . . . I also write in a way that emotionally resonates with the audience. I want something to be at stake emotionally for every story I write . . .
My weaknesses? I have a long list. I’m well aware of my limitations as a writer. I will never be stylish. I will never have a particularly interesting prose. When I read contemporary fiction, I recognize prose that is beyond my grasp. Hashimi, too, is a gifted storyteller and a competent writer. Born in the United States, she is the daughter of Afghan immigrants. Her parents left Afghanistan in the 1970s, planning to work in the U.S. for a few years, but ended up staying permanently after it became clear it was unsafe for them to return. Her mother, an internationally trained civil engineer, was one of the first women to enroll in Kabul University’s engineering program. She also had the idea for “Pearl” percolating. Eventually, she put the “Moon” manuscript aside to give the second book her undivided attention. She wrote “Pearl” in nine months — it came “in one big swoop,” she says — while she was working part time as a doctor and expecting her second baby. I have an extra copy of When the Moon is Low I would love to give away — please comment below or send me an email at bksonthetable@gmail.com, and I’ll toss names in the proverbial hat in a couple of weeks. For more reviews, please visit TLC Book Tours. The book sounds wonderful! Adding it to my TBR list now. Oh, I do want to read this one–I loved Hashimi’s first book! Sounds intense and relevant- my favorite kind of book! Oh my – so much to love about this review! I had never heard of this book, but now want to read it! Hashimi sounds like such an amazing, brave, and accomplished woman. And – I plan to read The Underground Girls of Kabul for Nonfiction November this year! I met Hashimi at an event during BEA, and she had copies of The Pearl that Broke its Shell. I am really looking forward to this one as well. Little Bee was an amazing but heartbreaking book. Any book that you can compare to that definitely has my attention. I had heard of her Shell novel but hadn’t heard of this one. I really liked Little Bee. The Moon Is Low sounds like it involves quite a journey. This novel sounds profound and meaningful. Thanks for this lovely feature and great giveaway. I have been fascinated by Hosseini’s books and other books about Afghanistan. Having both a son in the military who has been there and a brother who spent two years working for the US Department of Justice there, has increased my thirst for knowledge of this country. I would love to win this book. Fabulous review and post. THANKS. I read Hosseini’s books and Little Bee. Stopping by from Carole’s Books You Loved August Edition. I am in the list as #34 through #36. Please search for the book titles in the FIND A REVIEWED BOOK slot if you stop by or click on the links in Carole’s post.